Please consider submitting your work to this interdisciplinary conference on menstrual and reproductive health! 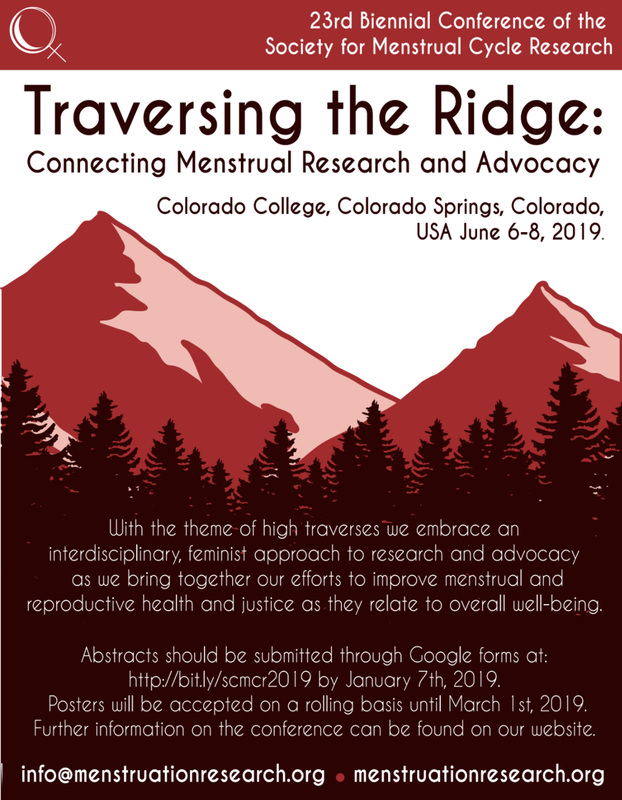 With the theme of high traverses we embrace an interdisciplinary, feminist approach to research and advocacy as we bring together our efforts to improve menstrual and reproductive health and justice as they relate to overall well-being. Breakout Sessions: Please consider submitting proposals for presentations that relate to one or more of these topics. However, if your work addresses another topic, don’t hesitate to submit a proposal to present that work. There are opportunities that will showcase the expansive nature of the SMCR scholarship, advocacy, and reach. Paper proposals: are for individual oral presentations for discussion that will be grouped thematically in sessions as space allows. Panel/symposium proposals: are theme-based oral sessions lasting approximately one hour and a half, consisting of three to four papers. We encourage submissions of organized panels complete with theme/topic, paper presenters, and order of the talks; please include a chair and optional discussant. Poster presentations: are formats that allow for extended discussion of the presentation with the author(s). Workshops: are intended as training and/or information sessions. Submissions should include the workshop title, the problem or expertise addressed, an outline of the proposed content, any specific “take-aways” participants should expect, and the time allotment desired. Roundtables: are discussions that focus on a specific topic or theme that could include, but are not limited to, debates on syllabi, jobs and the market, different types of advocacy, vulnerable populations, or issues of translation. This style works best for open discussion and should include audience participation, as well. Education Curricula/Activities: If you have implemented a successful menstrual education curriculum or activity, we hope you will share it with others. Please consider sending your curriculum/activity for posting on the SMCR website along with an informational cover sheet. Abstracts should be submitted through Google forms at: http://bit.ly/scmcr2019 by January 7th, 2019. Posters will be accepted on a rolling basis until March 1st, 2019. Personally identifying information will be removed from submission before review. Further information on the conference can be found on our website: http://www.menstruationresearch.org/conferences/#conference_2019. We have made affordability a priority and will be providing lower costs for registration and housing for those with limited means. We look forward to seeing you in June 2019!